Top 30 Free Student Binder Printables to Use Today! Wondering where to find the best free student binder printables? We have rounded up the most brilliant ones to ease your search. Welcome the school year with confidence with these organizing tools and have your best school year yet! Keep scrolling and you’ll be amazed to find out that there are plenty of brilliant school planners that are unbelievably free to print! We’re excited to show you what made it to our list of top 30! Yes, we’ve said it– we’re so thrilled with our Handpicked segment today. Thrilled because we’ve rounded up some truly amazing planners that you can use in school. We know how difficult it is to keep things organized once the school days arrive so we listed our best student binder printables and added the most amazing ones we found online! Here then is our Top 30 Free Student Binder Printables. discover what made it to this list! Get ready, you have a little DIY binder project to do today! Free Student Binder: This planner has 25 Free school organizers that includes goal-setting sheets, grade tracker, class directory, reading log assignments and more! Ultimate Free Student Planner: With over 40 printable planning pages, this ultimate free printable student planner covers almost all the organizers you need in school. Did I already say that each page also comes with super cute stickers, too? Fun Student Planner for Kids: Looking for a planner for your little ones? You’ll love this next one created by the Home Printables blog! You’ll be surprised to discover a complete range of organizing freebies all designed to ease you in school . And yes, this also comes in super cute design! Fun Student Planner for Kids: If you’re looking for no-frill school binder printables, this is the one that you might love to use! This planner comes in really simple layout that’s less on ink. It covers helpful school planning pages such as reading log, homework planner and more! Cute Planners and Calendars for Kids: Wondering where to find student calendars for kids? We’re guessing, you’re going to love this next one we have for you! It’s a truly playful calendar that comes in nautical print. It’s designed for students for all grade levels! School Calendars in Colorful Print: We’re guessing, you’re going to love this next student calendar, too! Each calendar for the month comes in new color that are definitely bright and cheery, Perfect to use as school planners! Free Back-to-School Planners: If you’re getting ready for the new school year that is coming near, you’re going to love this back-to-school planner! It has 20 adorable student binder printables that will ease you as you welcome the new school year. Homeschool Planner: Calling all mommas with homeschool kids, this next planner is for you. This brilliant homeschool planner has almost complete planning pages needed for you to get organized in school. We understand how challenging homeschooling can be so this 30-page home school binder is for you! Printable Reading Log: Looking for a reading log? You can definitely use this free printable one found at Shining Mom blog! Assignment Planner: If you’re having a hard time keeping track of your homework, we’re pretty sure this can help you organize everything immensely! Password Keeper: Never forget a password again! This free password keeper that comes in most beautiful florals will help you organize all your contacts in one spot. Be sure to snag your of copy of this pretty log! This makes a great addition to your student binder printables. Bullet Journal Printables: Calling all Bujo (bullet journal) lovers, this next printable is for you! If you like bullet journaling but you don’t have time to draw and write everything from scratch, you’re going to love this. It has the cutest design! Lunchbox Note Cards: Looking for some heartwarming or funny lunchbox notecards? You’re going to love the printable sets included here! Student Binder : Found over Just a Girl and Her Blog site, this simple student binder printables set is also something that you can take a look at. Free Student Planner: Here’s another brilliant student binder printables that you can also consider to print! It has a very basic layout that’s easy to use. Daily Planner: Organize your daily activities with this beautiful daily planning pages. Yes, it’s complete from Monday till Sunday! Weekly Planner: Be more productive each week with this beautiful weekly planner that comes in gorgeous florals. Monthly Planner: Print out this monthly planner to stay on the goal each month. If you love anything floral, you’re going to love this very pretty floral planner. Month at a Glance, In Advance Planning Sheets: Plan your month in advance with this darling freebie! Goal Setting Planner: Stay productive and focused with this amazing goal-setting planner. College life will be more productive with this! Bills Organizer: Keep a record of your bills with this free organizer! It will help you save and budget! Budget Planner: Learn to save and invest more. Be sure to snag a copy of this budget binder to help you keep your finances in order, all through your college life! Project Planner: Have a system when it comes to project-planning and project-making. This planner will help you ease things out! Kids Basic Planner: Hey, there’s also a cute planner especially deigned for the younger students. And oh, did we already say that it comes in cutest print? After School Routine Printables: Moms, print this out for your little ones. Learning Folder: You can use this comprehensive kit to help the little ones in school. Free Chores Chart for Kids: Teach kids to be more responsible with this cute chores chart! Classic Student Binder : Created by Home Printables blog, this classic student binder is one of our most loved planners. Do check it out! Happy Life Planner: Another planner created by Home Printables, this cheery planner is designed to help you have a “Happy Life” as you welcome another school year! Roundup of 200+ School Printables: Wait there’s, more! 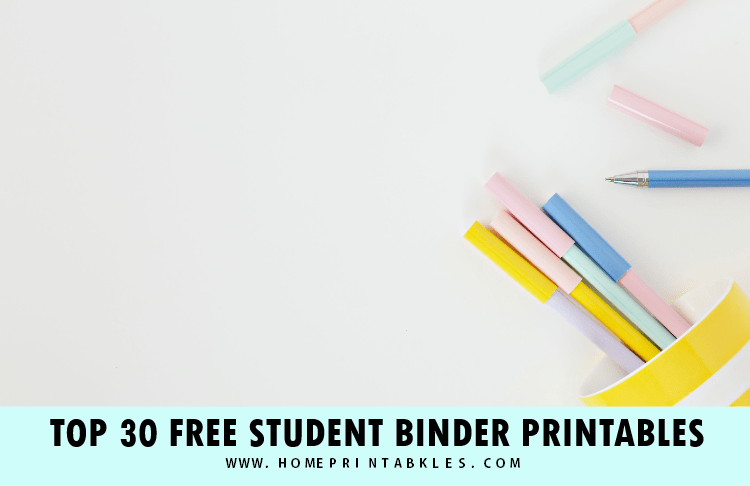 Should you like to check out another list of free student binder printables, to hop at Shining Mom. It has loads and loads of free school organizers that you can also print for free. I am also adding some planners for teachers! If you’re one of them, here’s a shortlist of some amazing teacher organizers that you can use. Yup, they’re also FREE! Do hop over to our very own Classic Teacher Planner with over 30 planning sheets to ease you in school. And next, go visit the Ultimate Teacher Binder that comes in really cute and dainty print. You can use them to get organized in your classroom, especially if you are a class adviser. And if you’re a momma, you might want to view the ultimate Mom Planner that is so popular these days. It’s not free but it’s truly affordable! This household binder for moms will help you manage your life and home blissfully. Additionally, you might want to check out the Back to Basics Binder which is a complete organizing system that will get everything sorted out. And of, before you go, here’s a quick link to our favorite products that you can use when printing out these student planners. The products listed contain affiliate links, but rest assured, we only recommend items we love. You may read our full disclosure policy here. Thanks! That’s about it for today. 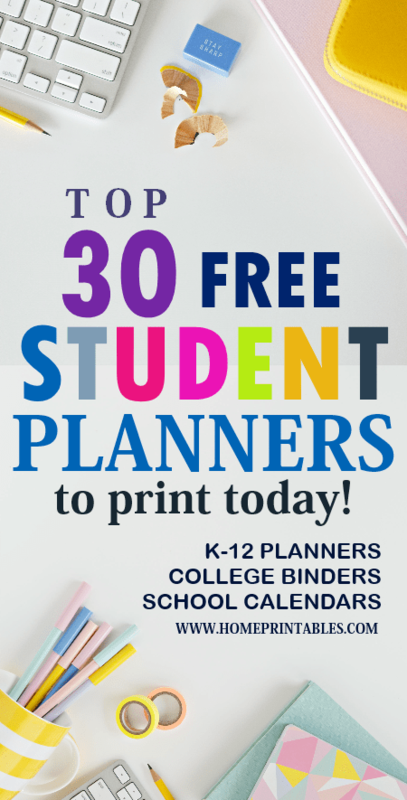 We hope that you can use the free student binder printables and the other amazing planners we have included in this post. May they bless you immensely and may you have you best school year yet! Do well in school!